Granny Vee’s “Happity Birthday!” book. 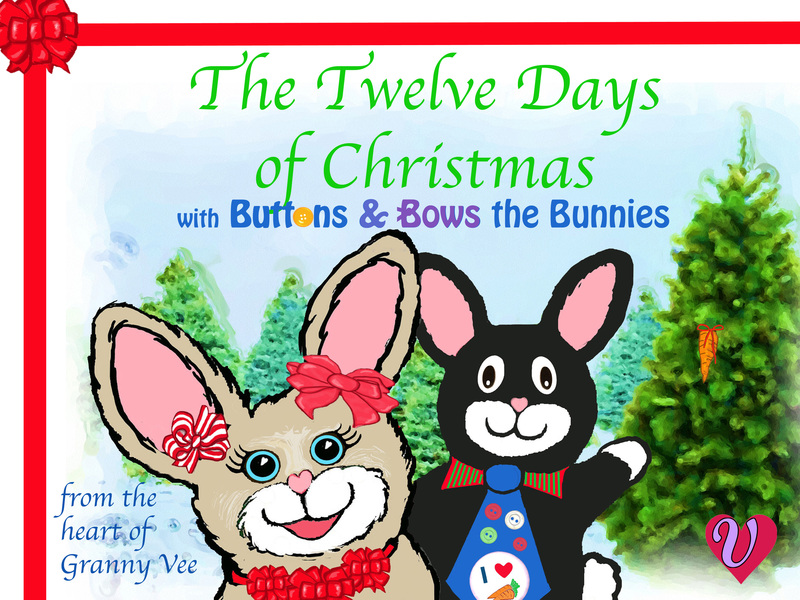 The 34-page picture book tells how Gloomy Gray Gloppens don’t spoil the fun on Buttons’ and Bows’ Birthday! Once upon a time on a beautiful spring day, a purple princess played happily in her garden with her ball. The princess could never decide which she liked best: the garden or the gold & purple ball. In the garden, her purple roses had a sweet fragrance. But her gold & purple ball was glittery. In the garden, her water lilies were lovely. But her gold & purple ball shimmered in the sunlight. In the garden, her purple carnations were perfect for wearing with her bows. But her gold & purple ball was ever so much fun. It could be thrown way high into the blue sky! She looked at her shimmering ball. “And I’m blessed to have such a beautiful ball!” The princess then skipped playfully and threw her ball as high as she could. The ball soared high into the air, glistening in the sunlight! The princess was so excited that she started jumping up and down and clapping, just watching the ball go so high. Then, as all balls will do eventually, the ball started falling… falling… falling back down. But the princess was so caught up in jumping and clapping that she missed catching the gold & purple orb on its descent. And so the ball fell and went “splosh!” right into the lily pond! Now lily ponds have murky water that grow beautiful water lilies. But this is not the kind of water in which a princess would want to swim! It had all this green, slimy stuff floating on top of the water. “Yuck!” she cried. Just then a Striped-Belly Green Frog leaped out of the murky water. “No problem!” replied the frog. “Of course, I forgive you.” He was really too kind to hold a grudge. “Then why won’t you get my ball for me?” cried the princess. Phil laughed at the thought. “We just all need to help one another. Now, I had better fetch your ball before it sinks down too deep in the mud! I’ll be right back!” With that, he leaped into the slimy pond. The princess peered down after him but she couldn’t see a thing! “Oh, I do hope he can get my ball,” she prayed. Then suddenly the Green Frog jumped high up out of the water and landed on a lily pad. His hand held the treasured gold & purple ball! “My ball!” exclaimed the princess. Phil jumped on dry ground and handed the princess her ball. “Okay!” The princess threw the ball as fast as she could. “Catch this one!” Phil, with a leap to the side, caught it easily. So the two hopped happily around the garden playing ball. Hearing their laughter, soon many friends in the neighborhood came by and joined in the fun and frolic. Afterwards, they all sat down to rest. The princess shared blueberries from her basket with all. “No!” replied the princess. “That is not what I realized, either. What I really like best is not a thing at all! Why I have a much, much greater blessing! I am blessed with friends and family who really care about me.” The princess proceeded to give a big hug to each of her friends. When she reached Friendly Phil, she noticed the golden heart on the frog’s chest. “You do deserve that heart of gold for you have a true heart of gold!” The purple princess then surprised the frog with a sweet little kiss on his green chubby cheek! If you had someone call you “yuck”, would your first response be to get angry? That would be quite normal but we should try to be better than “normal”. We should practice “self-control” which is simply controlling yourself. A princess or a prince should practice “self-control”. But maybe the princess was upset because she lost her ball. Other than being with friends and family, which would you like more: the garden or the ball? How can you be a friend who loves at all times? What do you think the bracelet says? All one can see is “Princess, Lo” but it says more! The Purple Princess is really Bows the Bunny playing “princess” as most girls enjoy doing! How many animals played ball? Don’t forget the Baby-Blue Bee! The poem here is one of my granddaughter’s favorites and she can read it all by herself! See the story of a real queen! It would take their sacrifice, their courage, their patience, their love. Through perilous seas by the Lord’s gracious hand. And lifted their voices in thankful blessings to God. And built a common house, the start of their plantation. And forests filled with nuts and berries and other tasty things. But the Pilgrims, without complaining, trusted in God’s care. God forged these hardy Pilgrims, and destined a new nation. And prayed for a harvest of a hale and hearty yield. So over that first summer, lasting friendships were gladly made. With a time of prayer and feasting – a Thanksgiving Day! Feeding all those people would really be a chore! They came loaded down with goodies to add to the feast! The Indians brought plump turkeys and plenty of deer meat. The Pilgrims cooked fresh veggies: carrots, onions, turnips, beets. And the Indians popped popcorn! Yes! For the Pilgrims, a new treat! But Thanksgiving is more than food and fun: it is a time to pray. Remembering God’s goodness, a prayer of thanks was said. In the beauty of the autumn, this celebration was begun. That very first Thanksgiving was not one day … but THREE! See a silly poem for Thanksgiving! Go here to meet our friends!